Here is an introspective and humorous look back at one man’s nearly three decades in radio broadcasting. It’s a love letter to the career that got away, along with a frank assessment of the people who made it work when it was good and made it worse when it wasn’t. It’s at once funny and wistful, brutally honest and self-deprecating. The mechanics of the industry have changed, but the strengths and weaknesses of the people involved resonate just as profoundly today as then. This is a book for anyone who has ever listened to a radio personality or who has been/wanted to be one himself/herself. Hopefully, for the reader, it will be a bright light focused on the human condition. The author has fulfilled a promise not to whine about the way things used to be. $2.99 on Kindle. Sometimes being ordinary is OK. In fact, sometimes being ordinary can lead to the extraordinary… all you need is a spark. Life can be tough, especially with the constant barrage of obligations, news, work, family events. It can be hard to find yourself and God through all the chaos. J. A. Richards’ memoir, An Ordinary Life, Extraordinary Spark, takes the reader through her spiritual journey and how she found God in the quiet, the mundane, the ordinary. While the author’s life is seemingly ordinary, her retelling of her dad’s death and its impact on her life shows how God works with and through ordinary people and events to make extraordinary things happen. How many people can say that the post office almost lost their dad? And say that with humor and grace? Only J.A. Richards, and only in this memoir. Although Richards’ recounts several other life events along the way, including her bumpy at-times faith journey, she also offers some tips and tricks to the reader so they can hopefully learn from her ridiculous (and sometimes painful) mistakes, and she does all of it using a humorous voice with a positive message. $0.99 on Kindle. Laura’s world spins as pediatricians throw words at her like heart failure, seizures, and g-tube feeds…when all she wants is to hold her baby tightly and be the mom she’d always dreamed of being. Join Laura on her emotional journey as she strives to rise to the unexpected challenge of motherhood to two special needs daughters. Witness her dance along the edge of sanity through a whirlwind of mind-numbing diagnoses, from a rare chromosomal disorder to autism. Experience heart-wrenching medical drama, from IV cut-downs to code blues. And…just as Laura begins to lose all hope…share in the joy of true love discovered. With Angel’s Wings – an honest and raw, 100% true story. $0.99 on Kindle. Life can be tough, especially with the constant barrage of obligations, news, work, family events. It can be hard to find yourself and God through all the chaos. J. A. Richards’ memoir, An Ordinary Life, Extraordinary Spark, takes the reader through her spiritual journey and how she found God in the quiet, the mundane, the ordinary. While the author’s life is seemingly ordinary, her retelling of her dad’s death and its impact on her life shows how God works with and through ordinary people and events to make extraordinary things happen. $2.99 on Kindle. Want to enjoy the life you are living, even as you face major life challenges? If you like touching stories, mindful wisdom, and a touch of irreverent humor, then you’ll love Sawatsky’s award-winning and life-changing book. $2.99 on Kindle. Alzheimer’s Daughter details a caregiver’s journey with both parents diagnosed on the same day. It is written with wincing honesty about the cruel affects of the disease, but a WWII love story held together by faith and family is contained within the pages. $0.99 on Kindle. Dr. Addy Conrad, psychologist, encounters the ethical minefield common to private practice. Susan, a professional and mother with whom Addy identifies, is torn by a traumatic childhood. But Susan is more complex than what originally met the eye, having colorful interior personalities, and one tragic disclosure plants Addy squarely in a quandary. Her peak challenge, though, is Michael, a striking but narcissistic surgeon, who finally discards his emotional hide-and-seek to disclose his raw pain. At times, Addy waivers under his seduction, especially as her own marriage falters. She warms to Michael as he reveals his vulnerable, undone psyche. His flirting is intermingled with genuine therapeutic work, leaving Addy swaying, as if on a precarious high wire. A serpentine client, Carmen, reeking of cigarettes, snags Addy’s old memories of her mother’s death by cancer. Countertransference—where the therapist projects someone onto the client—grips her. A beloved former professor helps her disentangle her own unprocessed feelings from that of Carmen’s. Dr. Conrad courts a growing unease for her friend, Dr. Sebastian Courtney, her intellectual idol. After working with his first severely abused client, he suffers from night terrors. She intuits that he is in danger beyond what he is disclosing. He has, in fact, slipped into secondary post traumatic stress disorder–taking on the pain and symptoms of his client. In a risky gambit, and partly blinded by her own attachment to him, she takes matters into her own hands. A testament to the human spirit, Sessions: Memoirs of a Psychotherapist, will challenge as much as it entertains you. “Out of the Shoebox” is a fascinating journal that reads like a detective story, comes across as an imaginative quest into the past, yet is the true personal story of the writer, Yaron Reshef. An unexpected phone call hurls Reshef into an intensive two-year journey, during which he has to solve a mystery that took shape in the 1930s and gradually unfolded in the present. A mysterious lot, a forgotten bank account, a people long gone – along with their memory which were obliterated during the Holocaust. All of these rise to the surface, bearing with them memories and emotions previously hidden away in the shoebox. “I had no intention of writing a book. I had no need to write a story in general nor a story about my family and the Holocaust in particular. But life being what it is, sometimes things happen in mysterious, even surprising ways. Stuff that used to take center stage moves to the background, and background stuff moves downstage and center. That’s what happened in my case.” (Yaron Reshef) Free on Kindle. Many people’s minds live in cages. People are limited to what they will accept and are stuck in their way of thinking. Seeing what I’ve seen and overcoming all that I’ve overcome has allowed me to be more open minded and look at life from different angles. 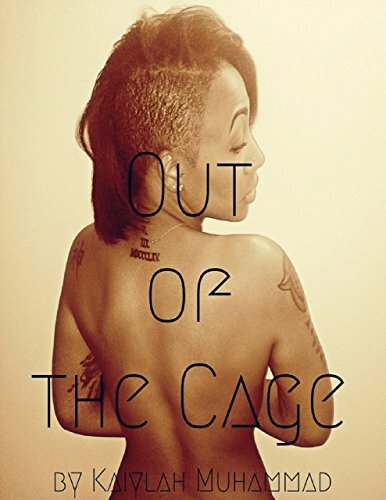 To be “Out of the Cage” means to break free from the demons that keep us from being all we can be. The book contains thirty memoirs that address the different demons we have within ourselves such as fear, pride, overthinking, bitterness and many more. In “Contact” the author recounts his experiences of two tours in Northern Ireland (in Belfast and Crossmaglen) as a Commander with Britain’s elite Parachute Regiment during the blood soaked 1970’s. Soldiers from Iraq and Afghanistan comment on how relevant the book still is today, as the dangers, political agendas and religious roots underlying the conflict are eerily and heartbreakingly similar to their own recent experiences. Feel what it’s like to live each day with senses on high alert, waiting to be shot by a sniper or blown-up by a well-hidden bomb. Enter the mind of a soldier ordered to hold the lines in an ancient quarrel they have little affinity for, but whose consequences are deadly. When little Hannelore (Hanna) Zack left Cologne, Germany, on a train bound for London as a seven-year-old Mädchen (young girl) on July 24, 1939, she had no way of knowing that she was part of the Kindertransport, an epic rescue effort that would save 10,000 Jewish children from Hitler’s Nazi regime by granting them safe passage to England. $4.99 for a limited time. What if you risked everything to follow your dreams… and they didn’t quite come true? Would you regret having tried at all? How about if those choices led to a life full of freedom and adventure? This is the story of one man whose 25 years as a struggling writer meant learning to accept near constant rejection while at the same time traveling the world on a shoestring and reveling in all of the wonders that life has to offer. It is a tale of love and loss, hopes and aspirations, and ultimately the realization that true happiness comes not from succeeding on someone else’s terms, but in the ability to redefine success on one’s own. “Memoirs of a Starving Artist” follows the author on a lifelong journey from Australia to Tahiti, Ireland to Estonia to Budapest and beyond. It is an inside look at what it means to be an ex-pat American writer in the era of the ebook revolution. Pony Tales is based on the true life adventures of Peta, a young woman trying to establish a riding school in the wilds of Canada. Read about her escapades and those of her students as they battle their way through eccentric characters, poverty, and the treachery of those mothers willing to do anything to win! If you love ponies, funny characters and mischief this is an entertaining read that will delight. Abandoned in a strange country with three small children, Peta struggles to keep ponies from wandering, goats from scaring unsuspecting mothers and cows from walking through fences as she tries to establish her riding school. She is plagued with the strange antics of parents, farmers, and even has to battle the mayor to rescue her cow from the local pound! Barely more than a kid herself she tries to keep her pupils from too much mayhem as they scare the locals while galloping madly through their gardens. This is a heart warming story about the struggles and triumphs of an unusual life.